Free static pressure calculator excel sheet xls below. 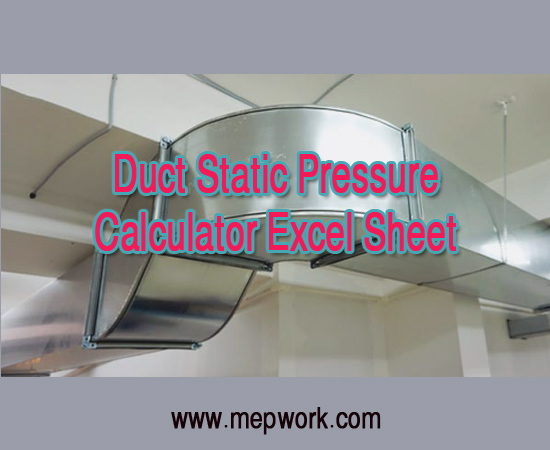 It is a simple spreadsheet program for calculation of static pressure in HVAC air duct systems. Static pressure refers to the amount of pressure measured in inches of water when air moves through an object, such as duct work. If the resistance to the air circulating through the ducts of any heating and cooling system. high static pressure indicates a problem with your HVAC equipment and ductwork. Something is putting undue stress on your system, and it will work a whole lot better if you identify the problem and eliminate it.